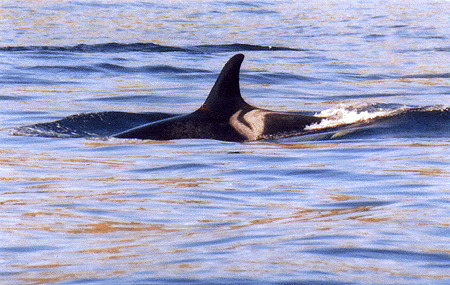 The whitish saddle patch on the Orca is distinctive and different for each individual. The saddle patch pattern is the key to identifying each individual Orca. This whale appears to be one that was named "Tahoma" of the J Pod. Tahoma was born about 1963 and died in the year 2000. Photo by Stephen Fjelstad.